Congratulations and well wishes are pouring in from all corners of Ireland with the announcement of the Irish Teams’ magnificent results over the weekend from the World Ploughing Contest in Njoro, Kenya. Ireland’s representatives on the world stage, Mr John Whelan and Eamonn Tracey won first and silver places respectively for Ireland in Kenya. Wexford man John Whelan fought off tough competition with an outstanding performance to become Supreme World Ploughing Reversible Champion for his country. While neighbouring county Carlow man, Eamonn Tracey also secured a silver place victory in the Conventional Class with a truly world class ploughing display. Both seasoned ploughmen and previous Supreme World Ploughing Champions, John has represented Ireland at the World Ploughing Contest 9 times, while Eamonn has represented his country internationally 12 times. 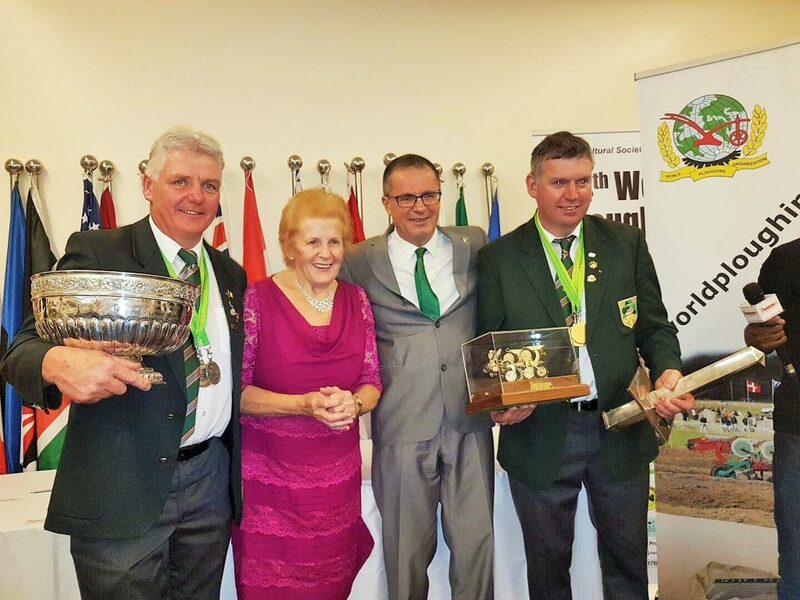 NPA Managing Director Anna May McHugh and Irish Ambassador to Kenya Dr Vincent O’Neill congratulate the Irish Ploughing team of John Whelan from Wexford and Eamonn Tracey from Carlow on their marvellous victory at the World Ploughing Contest in Kenya. General Secretary of the World Ploughing Organisation, Ms Anna Marie McHugh said “Ireland have always been highly respected internationally in terms of producing Ploughmen to compete on the world stage. However, Eamonn and John in particular are held in extremely high esteem not only in Ireland but across the international ploughing community. Another great result such as this for both men further adds to their global reputation as Masters in their field”. The Republic of Ireland were coached this year by one of Wexford’s finest Ploughmen, Mr Declan Buttle. Also travelling with the contingent to Kenya was Brian Mahon of Offaly acting as Judge. Proud sponsors of the Irish Team and delegation again this year are Kverneland. The Irish Team will fly home this Thursday morning in Dublin airport at 11.20am for a celebratory reception. For more information and full set of results please seewww.worldploughing.org and Twitter on @world_ploughing .